Defining do-it-yourself landscape design is a useful exercise: By exploring all its ins and outs, we may discover an aspect of this diverse field that we've been overlooking all this time. Let's begin with a basic definition that considers both aesthetics and practical concerns. Further, let's call this a definition specifically of do-it-yourself landscape design, so as to keep our discussion distinct from professional work. Do-it-yourself landscape design is the art of arranging or modifying the features of the grounds around a home to improve the property from an aesthetic and/or practical standpoint. This definition, however, raises the questions, "Aesthetic for whom?" and "Practical for whom?" The issue of aesthetics, in particular, is fraught with subjectivity. What one person finds to be attractive might not excite you at all. But this doesn't mean that nothing needs to be said about landscape aesthetics for the DIY'er. You may have your own distinct tastes, but there are still useful guidelines to help you achieve maximum aesthetic impact on your landscape. If you'll be selling your property, there are distinct home landscaping tips for you to learn; you must consider the tastes of potential buyers. If, instead, you're landscaping simply to suit your own tastes, you'll still want to keep in mind some general design guidelines for landscape aesthetics. Large lawns are useful for homeowners interested in badminton, ball playing, and hosting social barbecues. But if you're more interested in enjoying serenity, solitude, and contemplation, the role of turfgrass may be reduced drastically in favor of trees, shrubs, garden beds, etc. Plant deciduous trees to the south and west of a home to serve as shade trees, reducing summer air conditioning costs. Because such trees drop their leaves in winter, they won't deprive your home of sunlight when you need it. Evergreen trees planted to the north and west of a home serve as windbreaks. By breaking the wind, such trees reduce heating costs in winter. But after such practical concerns have been addressed, you'll still want to make your landscape design as aesthetically pleasing as possible. An introduction to aesthetics is as much a part of do-it-yourself landscape design study as is an introduction to its practical side. Regarding aesthetics, you first have some decisions to make about hardscaping, existing trees, and what you'll have as a view when you gaze out the window. Getting the hardscaping part of the project right will make implementing the softscaping refinements relatively easy. You do your hardscaping first, saving the refinements (planting) for last. Hardscaping constitutes the heavier work, forming the backbone for your landscape aesthetics. Leave such icing on the cake as the planting of beds of perennial flowers for last: They're delicate and will just be in your way during the hardscaping phase. Some basic guidelines follow for getting your landscape design project underway. Your landscape should be in harmony with your home to ensure unity. One consideration influencing unity is proportion. Large trees are in proportion with large homes but are out of proportion with smaller homes. When in doubt, however, leave the tree in place (unless it poses a safety hazard). Accentuate desirable views. If you live on a rural hillside with the potential for panoramic views, don't encase your home entirely in trees that obstruct your view. Don't cut down all the trees, though. Determine what your finest vistas are, clear the trees in just those areas, and use the remaining trees to frame those nice views. When set off like a picture by grand trees to the left and right, nice views become truly spectacular views. By contrast, you'll want to block out undesirable views. A suburban home with close neighbors is an ideal candidate for some sort of privacy fence. Privacy can be achieved via either hardscape fencing or "living" fences. 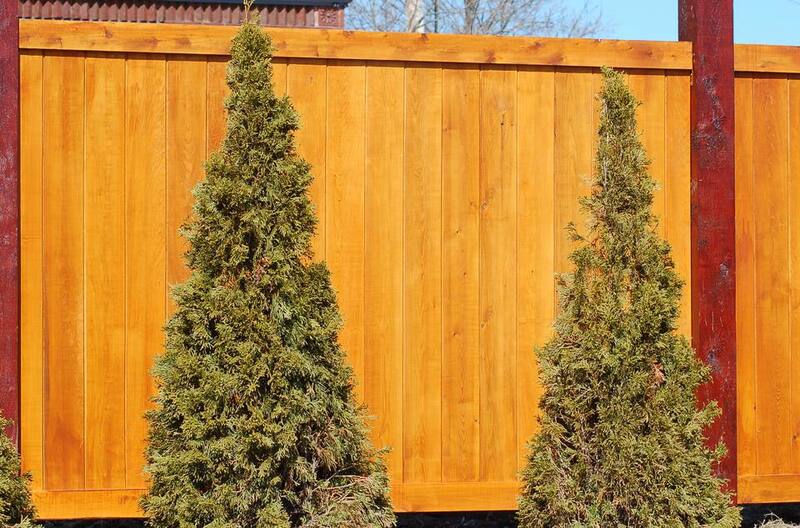 If you prefer living fences, your main decision is between planting a hedge or a loose border of shrubs as a privacy fence. With the hardscaping already in place, it'll be easier later to integrate the softscape with it in a seamless fashion. In the case of some hardscape features, complementary softscape elements are so commonly used in conjunction with them as to come to mind immediately. Let's look at these briefly. Water gardens, particularly those with fountains or statuary, can provide a focal point. Because such a water feature is, by itself, so impressive, the softscape needed to make it a true "garden" is minimal. A few container-held aquatic plants would be sufficient to supplement your hardscaping. Similarly, in installing gazebos, arbors, decks, and patios you're laying the groundwork to display your softscape in a more favorable light than would be possible without hardscaping. A vine on a well-located arbor becomes more than just a vine: It becomes a festive garland beckoning us to pass under its arch. Nor is building an arbor difficult. Gazebos, patios, and decks are excellent choices for showcasing window boxes and potted specimen plants. Using outdoor lighting extends the time you have to appreciate hardscape and softscape features. Christmas lights are a great way to spruce up your winter landscape design, winter being the toughest time of year to keep the landscape interesting. Not only are there fewer daylight hours in winter, but there's also inherently less visual interest in the landscape, so you have to make the most of everything at your disposal. As long as you avoid colored bulbs, there's also no reason why your strings of Christmas lights cannot double as lighting for a deck or patio during the summertime. Nor do you have to restrict yourself to Christmas lights, per se. A simple spotlight can do wonders. Picture a spruce tree, rising up out of a blanket of pristine snow, with a stone wall as a backdrop. By throwing a spotlight at night on this scene to highlight it, you create a winter wonderland. You'll want outdoor lighting during the summer months, too. But in some cases, you'll probably want more subtle, decorative lights rather than spotlights. The idea here is to be able to enjoy your garden more fully, rather than to show it off to others. You'll want to install a garden bench and enjoy the ambiance while dining outdoors. Here in the 21st century, we tend to assume that outdoor lighting means electric lights or solar-powered gizmos. But don't forget that our ancestors lit up the night for millennia before such lights were developed. In an age surrounded by electric, the luxury of candlelight has taken on overtones of romance and serenity. This is just the sort of mood you're looking to create with outdoor lighting. Yes, you do have to take safety precautions when using candles outdoors (never leave flame unattended). You don't want the wind knocking your candle over and starting a fire. But decorative glass candle holders are available on the market for just this purpose. Mexican tin candle holders are also sold for your outdoor lighting needs, and they're a great fit for Southwestern themes. For an Oriental, meditative flavor, Chinese lanterns can be purchased in various colors. Any of this outdoor lighting can be hung from shepherd's hooks, available at most nurseries. Simply insert votive candles and close up the lantern securely. A few of these placed strategically around your favorite garden patch will light the area sufficiently to make for an ideal spot for a late-night snack in the spring or fall. For dining in the summer garden, add a few stakes armed with citronella candles for natural mosquito control. You have a decision to make in landscape design concerning how much space should be devoted to gardens, as opposed to lawn areas. This also raises the issue of the various garden styles. Now that your structural elements are in place and lit up, it's time to turn your attention to the softscape, and especially to garden designs. Typically, your softscape will include at least some lawn. The percentage of your softscape to be taken up by lawn will depend both on practical and aesthetic considerations. If a flat expanse of grass just isn't inherently interesting enough for your tastes, you'll probably want flowering trees in your softscape. You'll get a great deal of satisfaction from choosing between the different garden designs to be considered. Vegetable gardens are eminently practical. But don't underestimate their aesthetic potential. Evenly planted rows of leafy vegetables can be very attractive. Cucumber plants can be trained up a trellis or over an arbor just as any other vine can. Another garden type that can yield aesthetic as well as culinary delights is the herb garden. The knot garden, pleasing to lovers of geometry, is often composed of herbs. Cottage gardens typically rely heavily on perennials. Recalling the traditional English countryside of the peasants, cottage gardens represent the informal design style. The formal landscape design style has traditionally relied heavily on shrubs tightly organized into hedges, forming geometric patterns. Besides water gardens, other garden styles that rely heavily on a natural element other than plants are the rock garden and alpine garden, the latter being a rock garden planted with alpine plants. Westerners have become increasingly interested in Japanese gardens. Exotic Japanese gardens rely heavily on both rocks and water, as well as wooden elements.